While FIFA is busy expanding the footprint of football to more nations than there are in the UN, ICC’s short-sightedness is shrinking the world of cricket to just 10 nations. As the football World Cup captures audiences and imaginations across the globe, some figures are instructive. Just four decades ago, football was a game traditionally played by countries from Europe and South America. In the 1978 World Cup, just three places were made available for countries from Asia, Africa, Australasia, North America, and Central America. This year, in Russia, there are 13 nations from these regions in World Cup contention. In other words, football is an expanding game. And this is by design. The Fédération Internationale de Football Association (FIFA) has been beset in recent years by accusations of corruption, misgovernance and sleaze. But it has undoubtedly helped democratise the sport and spread its appeal across the globe. This year, 209 nations entered the qualification process, and 32 teams qualified to play in Russia. If 209 competitors seem a lot, it is; even the United Nations has only 193 members. And FIFA says it intends to expand the World Cup to 48 teams from the next edition. As a cricket fan, I can’t help but applaud. Because, in next year’s cricket World Cup, the governing body of my favourite sport, the troglodyte International Cricket Council (ICC), has decided to reduce the number of teams playing to just 10. This is in a tournament which, in previous editions, has featured 16 countries— sometimes 12 or 14—and needs to have many more if it is to enhance its own prospects of survival. The scale of participation in the two World Cups reveals that FIFA has taken on, with messianic zeal, the mission of expanding the appeal and reach of the sport of which it is the custodian; the ICC seems determined to do the opposite. It is striking that the most populous countries in the world have been marginal in world football. China, with 1.4 billion people, has only featured in one World Cup (in 2002). India, with 1.33 billion souls, has never come close to qualifying. The fourth and fifth most populous nations, Indonesia and Pakistan, have never made it to the grand stage. FIFA sees this as a challenge, and an opportunity. Now football is growing in popularity in China, where President Xi Jinping has announced his desire to host a future World Cup. In India, the politics of football administration has divided the sport into two rival fiefdoms, but the fan base has been growing, undeterred. Television ratings in India for European football leagues have been vaulting to record levels each year. This has spurred interest in the new Indian Super League, and even in the national team. India’s world ranking has improved from 173 just three years ago to 97 today. Making it to the world’s top 48 no longer looks like an impossible dream. 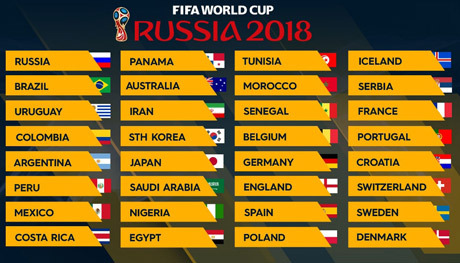 Left: 209 nations entered the qualification process for the 2018 FIFA World Cup! These 32 made it to the final qualifications. 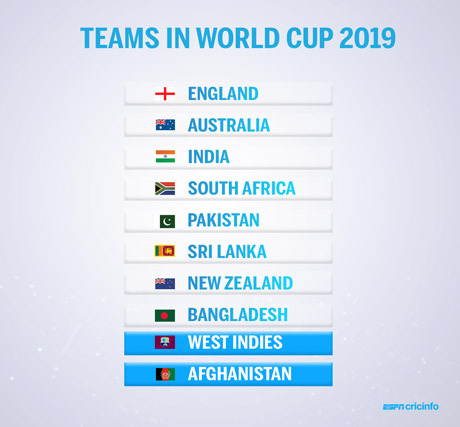 Right: A meager roster of 10 teams competing for the 2019 ICC Cricket World Cup. The contrast with cricket is glaring. Though this most beautiful, complex, and aesthetically pleasing of sports has been enhancing its appeal in a number of nations not traditionally associated with the game—reflected in the recent acquisition of elite Test status by Ireland and Afghanistan—the ICC seems determined to take the “world” out of the World Cup. This, despite the pleas of some of the game’s greatest stars. Sachin Tendulkar has called for a 24-team World Cup; the late Martin Crowe wanted an expansion to 18. While the ICC World Cup offers legendary rivalries like that of India and Pakistan, the broader trend of exclusion rather than inclusion is shrinking the footprint of international cricket. Moreover, the ICC has slashed grants to associate members by some 75 per cent in the last four years, and abolished the 6 per cent allocation for funding the development of the game in non-cricketing countries. The short-term objective (more money-making matches on TV) has trumped the greater good (expanding the sport). FIFA understands that if a game is to grow, more countries need to be involved in a World Cup, to attract fans, win new acolytes, attract sponsors and government funding, and inspire new potential players. The ICC does not. So, while one World Cup takes football to new heights as a global sport, another World Cup will confine cricket to an insular few, unable to outgrow the mentality of the exclusive clubs in which the sport was born. Shashi Tharoor, an avid cricket fan and commentator, is also an award winning author of sixteen works of fiction and nonfiction. He has been Under-Secretary-General at the United Nations, and Minister of State for External Affairs and Human Resource Development in the Government of India. A version of this article first appeared in theweek.in.